Getting caught in the twisted web of love is a phenomenon anyone hardly has control over. 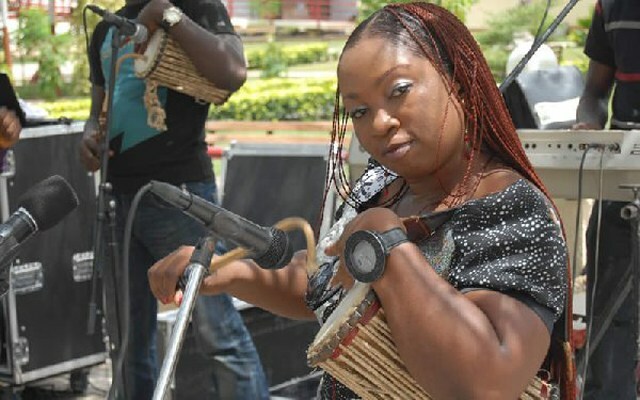 This is probably why sensational female talking drummer, Aralola Olumuyiwa, who has confirmed being in love again, was unable to resist the potent elixir of cupid’s arrow when she recently got shot with it after seven years of waiting for the man of her dreams. Confirming suspicions that she is in love again after seven years with her secret lover who Potpourri can tell you for free is royalty, the debonair entertainer, who recently debuted as a producer with the premiere of her movie, ‘Osunfunke’, told Potpourri in an exclusive chat that she is currently immersed in the bliss of love, after a long wait and it is for good this time. “Love has found me again, for good this time and it’s a beautiful feeling, it was worth the wait. I’m still keeping it under wraps for now though, I mean his identity”, she said.